The motto"sub hoc signo vinces" translates from Latin: "Under the(this) sign you will conquer." It is attributed to Constantine the Great when he crossed the Milvian Bridge in Rome. Constantine is reported to have seen a vision or sign in the sky that was a premonition of his victory. 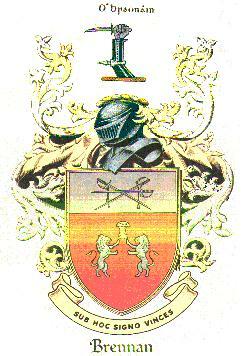 Jennifer Geerts Brennan sent me an email that she was marrying a Brennan and was looking for a Brennan family crest, and found yours on the web. Do you know the translation of the 'motto' on the bottom of the crest? She gave me a great opportunity to contact a good friend who has a great knowledge of the classics, and he had no trouble recalling this motto. This is the research I will submit on my wife's family "The Brennans". I will start with her and work back. I have some portraits and photos of headstones. 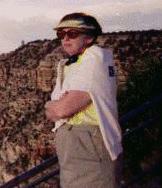 This is a picture of Chris at Grand Canyon South Rim in April of 1996. The Watchtower is in the background. Christine Ann BRENNAN was born 27 Sept 1946 in Plattsburgh, Clinton co, NY; the daughter of Clarence and Elizabeth (SPELLMAN) BRENNAN. She grew up in Dannemora and Chazy Lake, NY., and attended Dannemora Grades and High School. She graduated from Dannemora High School in 1964, and attended State University NY at Potsdam for 4 years and then taught High School English in Peru, Clinton co, NY, from 1968 till 1974. She married 09 Aug 1969 Roger Jon BIGELOW in Dannemora (Home town of both). Roger worked for U.S. Customs in Champlain, NY from Apr 1972 to May 1974, and then transferred to Toronto, Ont CA. Chris and child Jeff came along to Toronto to keep him out of trouble. The family lived in Rexdale, a suburb of Toronto, for 2 years and then transferred to their present address in Massena, St. Lawrence co, NY. Rod retired on Sept 3, 1999, with over 31 years in Government service. This is a picture of Clarence Brennan (1996). Parents of Christine: Clarence Anthony BRENNAN, b 5 May 1907 in Dannemora, Clinton co, NY; died 2 Nov 1997 in Plattsburgh, Clinton co, NY, 90 years old ; m 21 Apr 1941 Elizabeth (Betty) SPELLMAN in Elizabethtown, NY, she born 29 Nov 1910 Elizabethtown, Essex, NY; died 8 Aug 1985 Burlington,,VT; Only one child Christine Ann born 27 Sept 1946 in Plattsburgh, Clinton co, NY; Clarence built his own home in Dannemora with his uncle Jack. 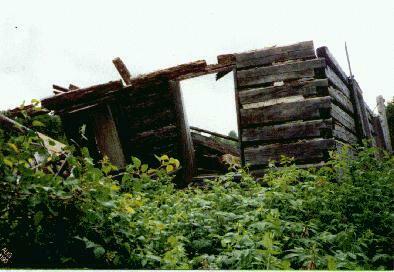 He also built his camp on Chazy Lake in the 1950's. This is a photograph of William James and Elizabeth Jane (HAYES) BRENNAN. (undated) Parents of Clarence BRENNAN and my wife Christine's grandparents. William James BRENNAN, was born 12 Nov 1871 in Nashville, Clinton, NY, the youngest of at least 6 children. He was the son of Michael Martin BRENNAN and Lady Mary FITZGERALD. He died in Dannemora, NY in 1925. His wife Elizabeth Jane HAYES was born 12 May 1877, the daughter of Michael and Bridget (GALLAGHER) HAYES, and died 19 Dec 1960. Elizabeth was the Democratic Chairwoman for Clinton County in the mid 1920's, as was her brother chairman John HAYES. In 1924 she entertained Eleanor Roosevelt for tea. iv. Mary Thrissa, b 04 Feb1906 Dannemora; d ____ ; m Michael Collins. ix. Donald, b 1918; died 1996; m Dorothy Ayotte; resided in the old Brennan homestead of Dannemora, built by William James BRENNAN; wintered in Myrtle Beach. Michael Martin BRENNAN was born in Ireland and Mary FITZGERALD. Martin (father of William James Brennan) was born about 1828 in Kilkenny, Ireland. He was the second child of Michael and Alice Brennan, both born in Ireland approximately 1795-1805. Martin (whom I've never before heard referred to as Michael Martin!) had eight siblings. Patrick, Martin, Catherine and Nicholas were born in Ireland and the family immigrated sometime around 1835, probably through Canada. 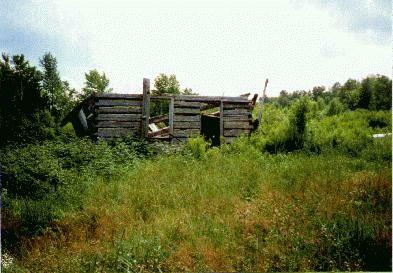 They were living in Clinton County by 1840. Mary, Bridget, John and Ellen were born in Beekmantown. I have a map showing where they lived--on a farm just to the west of Beekmantown. I have traced all siblings but John and Ellen. Michael died between 1850-1860. Alice died between 1860-1870. I assume they are buried somewhere in Clinton County. 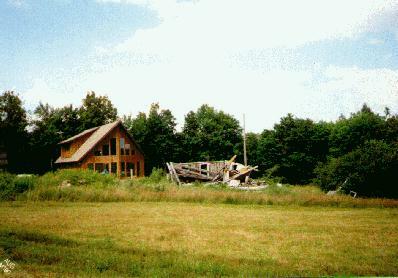 Below: Three views of old homestead of Martin Brennan, before it was torn down. My surname is Brennan, and it may be of interest to you that there are many Brennans living in County Longford, Ireland. I myself am in London, and was born in England and would be interested to hear whether you have any connections made between the above town and the surname Brennan. I was going through my bookmarks from 2 years ago, and I found the link to the Brennan family pages on your site, but they are no longer there.... is there a new location for them? My daughter is doing some research on the Brennan family crest. She became interested in where the family came from in Ireland. My father-in-law, James Arleigh Brennan was actually born in New South Wales, Australia. My father-in-law's father, James Harley Brennan was believed to have been born in Ireland, but moved to Australia and married Alice Doolen who was of Irish decent, but born in Australia. I'm afraid this is all we know. Both of my in-laws are now deceased so we can't ask. Any info you may have would be appreciated. Heidi Brennan and daughter, Kelsey. Someone told me to search my name "Christine Ann Brennan" on Google and see what it came up with. I came across your site. I am from Newcastle Staffordshire in England, my father was named Patrick Brennan born 1912 and died in February 1984 and his mother was named Elizabeth. I remember my father once telling me that his great grandfather (I think) married an American lady and the only address I have is South 14th Street, Pittsburg. Have you any suggestions as to where I can start searching or is this information of any significance to you. My name is Mary Kay Mahoney and I read with great interest the genealogy information on your website. It seems that I have been researching your wife's Brennan line as well. My g-g-grandmother was Catherine Brennan Mahoney, sister of Martin Brennen. Martin (father of William James Brennan) was born about 1828 in Kilkenny, Ireland. He was the second child of Michael and Alice Brennan (see below) both born in Ireland approximately 1795-1805. Martin (whom I've never before heard referred to as Michael Martin!) had eight siblings. Patrick, Martin, Catherine and Nicholas were born in Ireland and the family immigrated sometime around 1835, probably through Canada. They were living in Clinton County by 1840. Mary, Bridget, John and Ellen were born in Beekmantown. I have a map showing where they lived--on a farm just to the west of Beekmantown. I have traced all siblings but John and Ellen. Michael died between 1850-1860. Alice died between 1860-1870. I assume they are buried somewhere in Clinton County. Your wife is related to more people than she realizes. Those Brennans were a fertile (and generally long-lived) clan! Patrick married Ellen Casey and raised about 10-12 children in Ellenburg Corners. Martin, as you know, married Mary Fitzgerald and had seven children, Michael b. 1858, Patrick, Mary, John William b. 1874, Martin and Lizzie. In 1870 I found them in Schuyler Falls. By 1880 it appears Martin had died and his widow, Mary, had moved to Saranac. Catherine, my g-g-grandmother, married Jeremiah Mahoney. They lived first in Beekmantown, then Saranac for many years. They had 12 children. Eventually the entire Mahoney family moved to Saginaw County, Michigan where their sons were lumberman, two eventually owning a mill and one becoming mayor of Onaway. All 12 children were living at Catherine and Jeremiah's 50th wedding anniversary. I have a photograph of the occasion. Catherine lived to about 85 and is buried in Stephenson, Michigan in the upper penninsula. Catherine has many, many descendants. I have her obituary and even photos of their farm in Saranac. Nicholas moved to Moriah, Essex County. He married a woman named Bridget and had 8 children. He was still alive at age 73 in Port Henry in 1910. Mary married Andrew Collins and also moved to Moriah. They had 8 children. Bridget married Alexander Brady and lived in Malone, Franklin County. They had 8 children. I lose track of John in Moriah in 1860. I don't know who Ellen married, possibly a Leonard. I know that I am related to your wife's Brennan line because I have an old newspaper clipping in a family genealogy file that shows the Brennan family from Chazy Lake at a Brennan family reunion! My father, Mike Mahoney, who died in 1987 knew that Catherine had a large family in upstate NY. Back in the 70s we even took a family vacation to the Dannamora/Saranac area. I wish I'd paid more attention to my father at the time--I'd have saved myself a lot of research. Do you have any additional information on the Brennan's? I am in search of Alice Brennan's maiden name. One source said it may have been Medill/Madole/McDowel/McDole but I have no confirmation of this. I also have no idea where they're from in Ireland....other than County Kilkenny. I was delighted to see your photograph of Martin and Mary's homestead as well as the photograph of William and Elizabeth. I live in Chicago and have quite a few genealogy lines running through Clinton County...Behans, Hooleys, Ryans. I think I'm part of that whole "Nashville" melting pot. I would love to share information with you. I hope your e-mail address is current. If you can't get back through to me by responding to this e-mail, I can also be reached at marykaymahoney@comcast.net. I look forward to hearing from my long-lost Brennan kin!! Thomas Hughes born in IRE on Dublin Road, Killkenny. Married Mary Disney. Child, Alice Hughes (b December 23, 1865-d November 26, 1917). Married William Edward Brennan (b May 27 1884-d May 30, 1934) on November 27, 1895 at St. Mary's Assumption Church.